A friend was looking for a ‘little flying adventure’ and mentioned that he had never been to Copenhagen. A few hours research later and a pleasant Sunday’s flying was in the plan. Baxterley (near Birmingham EGBB) to Texel EHTX for breakfast, then North along the Dutch islands to the German island of Helgoland EDXH for lunch, then head East past Kiel and NE up to Copenhagen/Roskilde EKRK for Dinner. It would be my first time at each airfield so in addition to checking the AIP’s (thankyou SkyDemon) I called them all. Helgoland advised that on a sunny Sunday they may well run out of parking space by late morning! Found a great alternative at Heide-Busum EDXB - nice Restaurant with outdoor seating and Super-Benzine fuel for the SportCruiser’s Rotax. Departed Baxterley at 0700Z heading East - London Info were still quiet and handled FP activation. Norwich gave a traffic service as we sailed over them at 5500ft until about 20m East of Molix/FIR boundary. Amsterdam Info were relaxed as usual and confirmed the various Danger Zones were not active. With the Dutch coast in sight they passed us to Dutch Mil who were not keen to talk so we switched to Texel 20m out. Texel advised they were using runway 13 with LH circuit. What!! Planning, noise-abatement, printed charts etc had all been based on 04/22. Having worked out how to get round to the North in order to join left-hand DW for 13 Texel accepted a request for a long straight-in. Next task was to find the runway - could see that it intersected the end of 04/22 but was not able to pick it out with confidence until about 2nm Final. Very friendly staff in the Tower said they only use Runway 13 about 3% of the time - so felt better about failing to plan for it! Texel is great example of a successful small airfield with mix of activities. Constant stream of GA traffic arriving/departing on 13, Parachute club Cessna Caravans were using 04 with 10-15 parachutists descending into airfield, Restaurant packed with families, and a local Bikers Group turned up for day out. Flying up the West Frisian Islands could be confused with Caribean. Clear water and stunning 10-15 mile beaches. The Islands are mostly holiday destinations and the majority have airfields. We flew at 3500ft - high enough to be above the noise sensitive areas and, judging by the number of aircraft seen passing below us, most Dutch/German pilots. Passed from Amsterdam to Bremen Info and it was just like flying in the UK on a sunny Sunday. Single Controller handling dozens of aircraft, multiple pilots transmitting over each other, “limited traffic due to too many contacts” - only difference is that he was speaking German and English. Busun also accepted a request for long straight-in approach and was able to practice my Schule-Duetsch to coordinate with couple of aircraft doing circuits. Self-service fuel was painless and very friendly ATC staff joked about my English inaccuracy when I self-reported 93 litres and they showed it was actually 93.1 on their display. Restaurant was limited but produced a one-off meal for my Vegan friend. Had flight-planned to fly East, passing to South of Kiel to the MIC VOR then NE up to Copenhagen as this would avoid a thicket of overlapping German and Danish Danger zones. It took 15mins to get a word in with Bremen Info - who confirmed the Danger zones were not active - so we were able to switch to Plan B and fly East of Kiel on almost direct track to Roskilde. 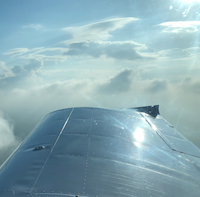 3,500ft again seemed a good height - above most of the traffic but below cloudbase. Copenhagen Info passed us to Roskilde Approach about 25nm out who confirmed we were No 1. We only needed about 10% of the runway 11's 1800m and turned off to the Esso and BP self-service pumps - Esso accepted my Visa so they got the business! Taxi from Roskilde to Copenhagen is about £90 - we opted for £15 Taxi to Roskilde Station then £11 train to Copenhagen centre - they run every 20-30 mins. Got into a Bar in time to join the Danes through the drama of extra time and penalties. Departure on Tuesday was brought forward so that we got through before the RAF100 RA(T) blocked off most of the East Coast and we departed Roskilde at 05:40Z (07:40 local) with aim of flying direct back to Baxterley - 530nm and 4.8hrs. Denmark and NW Germany provided superb views of the dozens of low lying Islands often with just a single small village on them. Our route included @ 280nm over the sea but we stayed within 20-25nm of the Coast until turning West to the UK abeam Texel. Although a long flight it was pretty relaxed and we talked to just Roskilde, Copenhagen, Bremen and Amsterdam in the first 2.5hrs. Landed at Baxterley 10:40Z with snacks and drinks left over - plus almost an hour of fuel still in the tanks. The Frisian islands are a favorite destination. Helgoland has too short runways for me to consider, though. Others going to these islands should know that several airfields are closed in the middle of the day during "Ruhezeit" ("quiet time"). Nice trip, but a question from my side - what aircraft did you use for the trip (ah, correction, Sport Cruiser.... ok).... At the same time, did you organise customs to 'check' you when you arrived in Texel? Concerning your 'failure to plan for 13', I've been to Texel maybe 25 times and not once diverted from 04 / 22 so at least you've given me something to ponder - thanks! - this approach was into Runway 21 (371m) and since that pilot destroyed the fence, they've not replaced it. However the airfield is on one island, the rest is on the next so you need to cross via ferry to the main island to actually see the island but once you've seen one North Sea Island, you've seen them all. @Full Metal Jackass - ref Customs I emailed flight and crew details the day before and had acknowledgement from Texel. No specific checks on arrival. Thanks for easing my conscience on Runway 13. That's a long leg back - do you have an autopilot? Hand flying for 5 hours would drain me! Thanks november_romeo. I love hand flying the SportCruiser but upgraded over the winter to MGL iEFIS and Autopilot in anticipation of doing long legs - money well spent. Great video Full_Metal_Jacket - hadn't seen that before. Not sure who was worse - the pilot or sunbather! Great trip and report, thanks. I have been thinking of doing similar; the Europa Club did a trip that approx. route carrying on up to the artic circle. Personally, after a couple of hours or so I need stretch but I am envious of 114ltrs tank. Did you submit a new flight plan at breakfast and lunch or did you file them all in the UK? I'd be interested to see your SD route. Thanks for this. It was only the other day I was doing some Google map surfing and saw the Frisian islands, and thought "what a cool place to do an island hopping trip to". Hitherto, I didn't know they existed. I'll put this on my to do list! Thank you for the very informative trip report. I am planning a similar trip in December, from Blackbushe to Norderney (via Texel, without stopping). 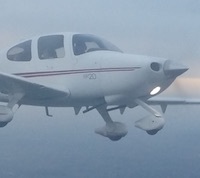 I am a French VFR pilot now flying in the UK. I have never been flying in any other Country than France and UK and I don't speak Dutch / German. Any thought for a first trip in the area would be hugely appreciated. Last point is about customs, is the German system similar to the UK one and I could land directly in Norderney by completing something similar to a GAR? @Birdyboy1 and @masterofnone - apologies for missing your posts. Yes the 114litre SportCruiser tank is very useful - as long as you don't drink too much coffee before takeoff! I submitted FlightPlans through SkyDemon after landing at each place as the aim was to have a leisurely breakfast/lunch so not in a great hurry. Will dig out the logs and post SD routes later. We are planning to re-visit the Friesen Islands next summer as they do look great and most have an airfield. @Sunseeker77 - thanks and glad it was interesting. Language not a problem as Dutch/German/Danish controllers all speak excellent English. Even for airfields that are not PPR I tend to send a quick Email in advance - especially if planning to refuel - so that they know we are coming and can advise anything we should know.